This charming bungalow is located at 5021 Jackson Street on Indy's west side is charming. Original hardwood floors in living area, hallways and bedrooms are in excellent condition, adding warmth to this lovely home. 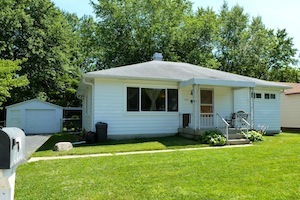 Well maintained home features new vinyl windows, a large fenced backyard with a tree lined lot. One and a half detached garage with covered patio space for entertaining friends and family. Located on a quiet dead end street. Easy travel time to downtown and walking distance to bus service.